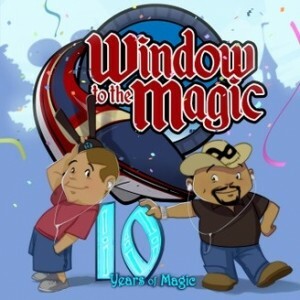 I keep thinking the opening song was from Lilo and Stitch’s Hawaiian Roller Coaster Ride. Ice Worker’s intro great peek into the Norwegian life and the background of Kristoff and Sven, also giving clues to the story we will see. Ice layer – breaking through. The two layers. People have use for the ice, if it’s controlled and cut to manageable pieces. The song alludes to the land’s frozen heart worth mining. Ice has magic (To preserve, stop time of decay), the song says. Watch your step, let it go! Stronger than 100 men. 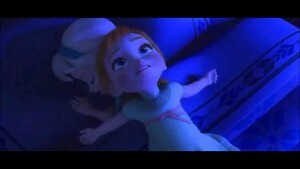 Little Anna is like Lady, “The skies awake, so I’m awake”. The little Anna and Elsa are so cute. Little Anna reminded me of Agnes in Despicable Me. Anna knows just how to get Elsa out of bed. The empty hall became a playroom with Elsa’s ice magic. We see Olaf for the first time. 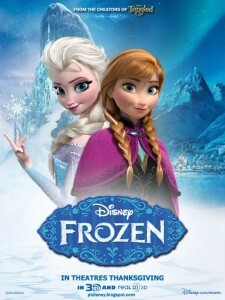 We see bits of situations we will see later; Anna sliding down snowy hills, falling into snow, going from one snowy hill to another, then when Elsa slipped and couldn’t magically build a snow hill for her to land on, she quickly show an ice bolt at Anna and injured her. The hair color change is a physical sign of something deeper changing. The storm scene was incredible. The stones in the burial scene reminded me of Stonehenge or rune stones. Open up the gates, like Willy Wonka. All the points of most little girls; Queen, princess, coronation day, opening the gates and people from everywhere are coming to see you. Another Princess sing a song out a window. Elsa’s coronation outfit is very British. First time in forever; Anna fun expectation, Elsa anxious, worry and fear. Big News for #Oncers that live near Orange County, California! an Elsa is Coming giveaway button from Disneyland, as well as other goodies! 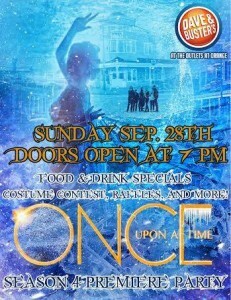 Dave and Buster’s at the Outlets at Orange, California is hosting an Once Upon a Time Season 4 Premiere Viewing Party on 9/28/14. Doors open at 7:00PM! View the premiere episode on a large screen, costume contest, food and drink specials, raffles, and more! Secret Code Phrase! If you attend and tell the party host this phrase “Once is Frozen” you will get a raffle ticket for another chance for cool prizes! I want to thank Maria for putting on this great event for Oncers! Please thank Maria for us! This entry was posted in Disney Once Again Podcast, Once Upon A Time Fan Podcast Full RSS, Once Upon a Time Podcast on September 15, 2014 by Admin of Storybrooke ;).